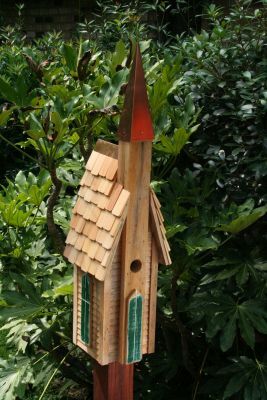 Church birdhouse is trimmed out in clapboard siding and toped with a gleaming copper steeple. Hand cut shingled roof completes the look. Post pocket mounting requires only a Heartwood post or any 4" x 4" - 1 1/2" hole works with Chickadees, bluebirds, nuthatch, swallows, titmice and wrens - proudly handcrafted in the USA. Dimensions: 9" x 9" x 34"